Simple, functional bag for shopping or leisure. Two pouches inside. Double-faced fabric with foam insert. Two-way-zipper, solid back and bottom. 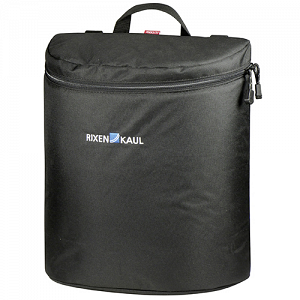 On the carrier adapter plate, the bag can be hung into the side slits by its black hooks, locked, and combined with boxes, topcases or basket. The sloped top allows easy access to the bag even when used in combination with baskets. Additional hooks with blue catch for standard-carriers 6-12mm included. If using hooks with blue catch, you do not need a carrier adapter. However, in that case you will not be able to lock the bag or combine it with topcases or boxes. The lower catch prevents the bag from swinging sideways. This bag can be used on either the right or left side and is therefore sold as a single bag. Since the GTA hooks sit flush with the GTA Adapter, a basket, topcase or box can be used simultaneously.